"Joan Foster is the bored wife of a myopic ban-the-bomber. She takes off overnight as Canada's new superpoet, pens lurid gothics on the sly, attracts a blackmailing reporter, skids cheerfully in and out of menacing plots, hair-raising traps, and passionate trysts, and lands dead and well in Terremoto, Italy. 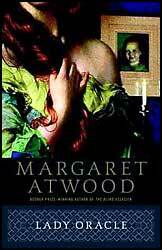 In this remarkable, poetic, and magical novel, Margaret Atwood proves yet again why she is considered to be one of the most important and accomplished writers of our time. " —The Publisher.